A report by Scholastic found that it’s not just little kids who like to be read aloud to – older kids love it, too. In fact, 83% of kids ages 6 to 17 reported they enjoyed being read aloud to. Adults tend to stop reading to kids once the kids can read on their own, but this isn’t necessarily the best thing to do. But reading with children helps with their cognitive development, even if the children can read themselves. It improves their language skills and development, vocabulary, and imagination. The emotional component is important, as well. Nearly 40% of kids ages 6 to 11 said they wished their parents still read aloud to them because it was a special time they shared. 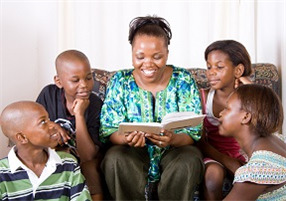 Why not set up a special reading time with your nieces or nephews? It’s a great way to spend some QualAuntie Time together. Take a trip to the local library or bookstore and pick out a book together. After reading the story, talk about what the book was about, characters, and what was learned. If you don’t live near nieces or nephews, there’s always Skype or FaceTime – read a bedtime (or anytime!) story with them and have a virtual chat about the book!